I was a passer by in Tromso, Northern Norway, for a few days. People like me come and go, hoping to come back, but never knowing if that place that got so deep into their heart will ever be seen again. We, tourists, travellers or those wanderlust infected, try to see in a blink all we’ve read about on TripAdvisor; we taste the food, try to spell the language, talk to locals, take lots of photos, post them and then talk about how it was with family and friends. But this land actually belongs to them ever since before we existed, before Tromso was a tourist hot spot and a popular hashtag on Instagram, from old times, when no borders were drawn in the North between the regions of Lapland, from Norway to Sweden, Finland and Russia. Back in the days when winters were harsh and snow could reach more than 2m high, the reindeers were already there. 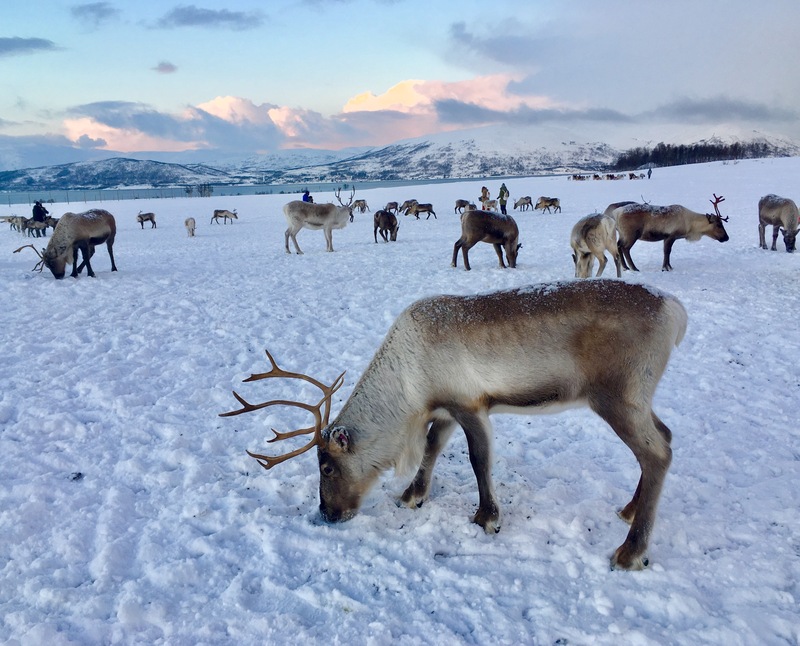 They still live free on the hills of Troms, many of them in herds which are taking care of by the Saami people, the indigenous population in the North. This union lasts for hundreds of years, in perfect harmony with nature, both parts helping each other survive the rough conditions in the Arctic. 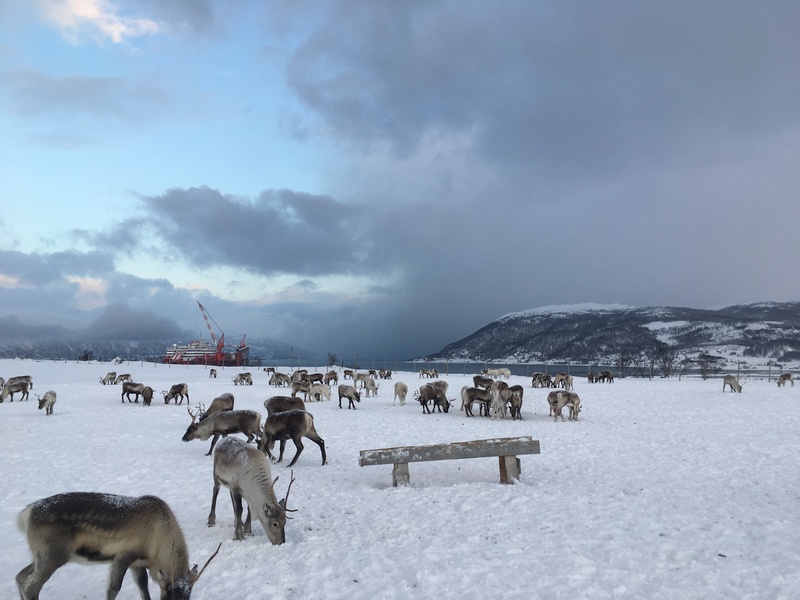 And a family just like this, with a herd just like that, of 200 reindeers, I was visiting in my last day in Tromso. 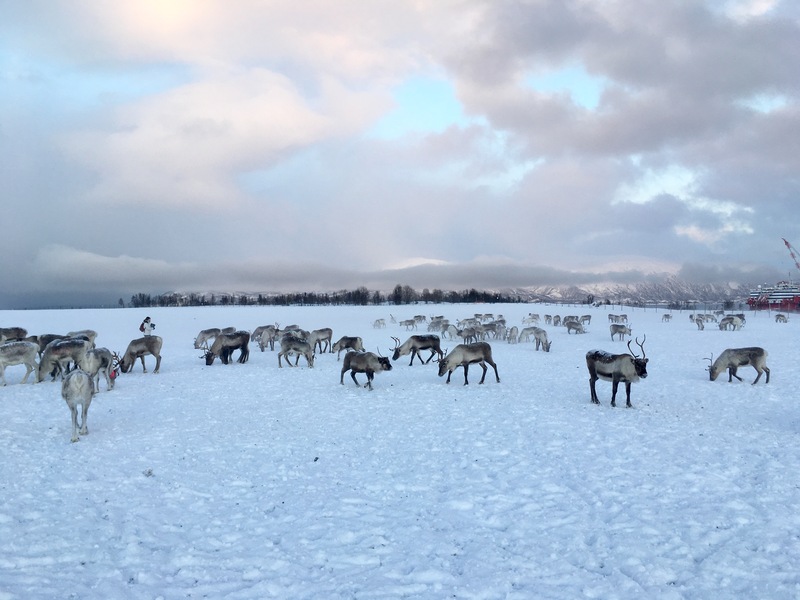 For someone like me, coming from a place where reindeers are the fantastic flying creatures in Santa Claus stories, actually seeing them for real is a true excitement. The moment I got off the car and saw a few reindeers behind the fence, on the white vast field covered with snow, among big snowflakes, all I wanted to do was run there and hug every single one of them. But, I hold my breath a bit cause we met our guest first: Lune, a beautiful tall woman, with long red hair, blue eyes like ice, snow white skin and the kindest of smiles. Do you know that type of person that you like instinctively and immediately? That was her. There can’t be a more friendly host. We were invited in the lavvu tent, a very high one made of wood piles and some sort of beige material, with a whole in the top where I could see the big snowflakes coming down to us and disappearing before reaching the fire above. This is specific to Lapland and the people living here for centuries. We all gathered around the big fire in the middle of the lavvu tent, sitting on wood benches covered with reindeer hides. It was warm and a light scent of wood and smoke made me feel so comfortable. We were told that our mail job for that day was to feed the reindeers, all of the 200 hungry souls outside the door. And since we were going to have a bucket full of food, they will be make an exception and be friendly. In the wild, it’s not gonna happen, they usually run when they meet people but now, during the cold months, the Saami family was protecting them from predators like the links or the sea eagle. The last one usually attacks the small ones by injuring them and than waits patiently a few days until they die. Since during the last years the eagles were protected by the law in Norway, their number has increased and they now represent a main danger for the reindeers. But the worst is climate change. Maybe the most affected areas are those where cold is a vital condition. If we can cope with a few hot days, with an unusual rain fall or with The beast from the East (the recent cold wave that affected most of Europe last week), warm temperatures in the Arctic are fatal for many species. Rain for example was not seen before in those regions, during the winter months. A few days with positive temperatures and rain are followed by icy temperatures and so the ground gets covered by a thick layer of ice that the reindeers in the wild can’t break so they can reach food. So they starve or get too weak to survive the predators. Maybe one of the most amazing example of how perfect everything is organised in nature is that related to the reindeer’s horns. They grow and fall as a natural process but those belonging to the males, if found in the wild, are picked by the Saamy people while those from females are never taken. They are very easily decomposed and high in calcium. So the female will get back to that place to eat it after she has her calf, this will help her produce milk. Also, other animals like foxes enjoy a good dose of calcium in the harsh conditions in the Arctic, where every source of nutrients is valuable. And so, with a very good reality check about life in the North I took my bucket full of food and entered the paddock. 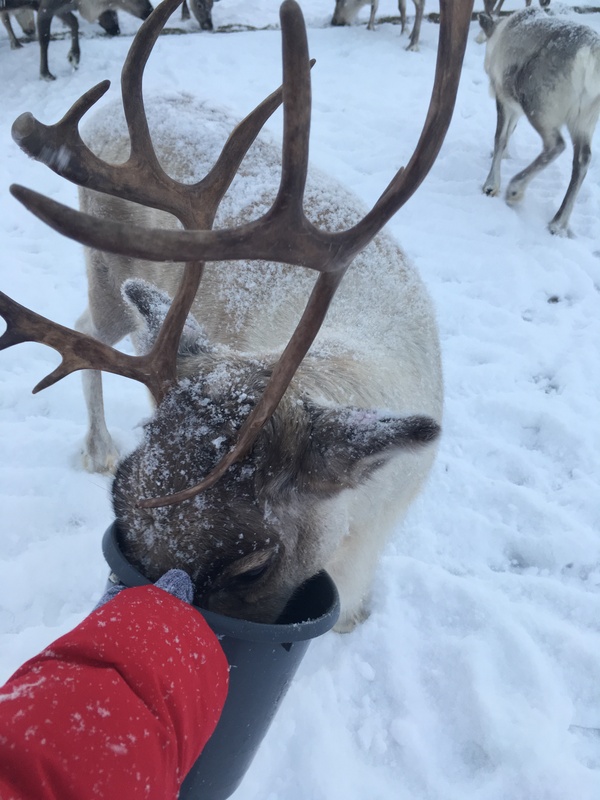 I couldn’t make more than one step cause 5 reindeers surrounded me, each of them trying to get his head first in the bucket and keep it as long as he could there, enjoying his meal. While one was eating another one was coming from his side and using his horns was telling him that he had enough and was time to leave the bucket for the next one. I wanted to get in the middle of the heard, 20m away so I hold the bucket up and walked as fast as I could. Once there, I was surrounded by reindeers, some big, some smaller, some brown, others almost white, some with small horns, other with big large horns and some even with only one horn, looking quite funny. It’s true, in the first minutes, seeing some of the males with large horns coming towards me fast or starting to hit others with the horns I was a bit afraid. But they are the cutest and harmless creatures. While they were eating I got the chance to touch them and feel how thick and soft in the same time is their fur, the horns that look just like bones and their fluffy noses, breathing with noise every time I got close to them. I think I spent around two hours with them. Since we were told to try to feed the shy ones too, I accepted the challenge to get the bucket to the shyest reindeer of the heard, the one that ran every time someone was getting 3 m close. I moved slowly, closer and closer, stood still when he looked ready to run again and let him come. Finally I won his trust and he came to eat. It was a beautiful place, a large field surrounded by the forest, mountains and hills, nearby a fiord, all was white and it was still snowing. The sky was turning pink as 1pm o’clock was announcing sunset. I tried the lasso and the 5th try was a success. I took a short reindeer sled ride and I was happy I choose the short option so I could spend more time feeding 4 buckets to the reindeers. I could have stayed there another 2 hours when lunch was served: freshly reindeer stew, a traditional meal served at weddings by the Saami. Was very good but it didn’t felt right that after playing with the reindeers I was now eating one of them. We gathered once again around the fire, in the lavvu tent. Now it was snowing so heavily outside that I couldn’t see a thing. Lone, our host, told us stories about the history and culture of its people, about their traditional clothes full of motifs, each of them having a specific signification like weather the man or woman were married, a signal for others to keep the hands off. She showed us the traditional Saami shoes, made of reindeer or seal skin, with fur on the bottom used in order to prevent slippage. We’ve learned craftsmen secrets like how to remove the hair from the reindeer skin with the help of the water from a river. It was a wonderful lesson about the Saami culture, no better place for that. We ended the day singing yoiks, traditional songs of the population in the North. Those sounds are so out of this world that during the middle age people who were heard singing them were accused of witchcraft and burned alive. I left the farm happy. It was the heaviest snow I ever saw falling in my entire life, in 1 minute outside the tent I was all white, covered in snow. But that’s how it should be there in the Arctic and that’s what make the reindeers happy.